One day, it could even be possible to take a pill and erase memories. Researchers have recently discovered two different types of memory use completely different processes in the same nerves, opening the way for a new pharmaceutical solution for treating anxiety and post-traumatic stress disorder (PTSD). The find challenges earlier research that had suggested memories of traumatic events used the same nerves in the same ways, making them impossible to physically distinguish. A team of scientists from Columbia University Medical Center (CUMC) and McGill University analysed neurons from a marine snail called an Aplysia in order to test a hypothesis explaining why memories of incidents surrounding a bad experience can themselves trigger anxiety. Neurons build long term memories by reinforcing the chemical bridges called synapses that link them together. An experience that could harm an organism, such as touching a hot surface or experiencing violence, becomes encoded as an associative memory as the connections between neurons strengthens. Experiences aren’t always quite so cut-and-dried; an organism might touch a hot surface as it hears a bell, or hear a dog bark nearby as they are assaulted. The bell might be related, or might just be incidental – neurons still record the information in case it’s necessary. Sometimes this incidental memory doesn’t do the individual any favours, triggering anxieties that do little to help prevent them from future harm. Many people with PTSD re-experience trauma by association with seemingly unrelated stimuli. “The example I like to give is, if you are walking in a high-crime area and you take a shortcut through a dark alley and get mugged, and then you happen to see a mailbox nearby, you might get really nervous when you want to mail something later on,” says researcher Samuel Schacher from CUMC. Anxiety caused by the incidental memory of the mail-box can interfere with a person’s life as encounters with similar innocuous mail-boxes produces a stress response, while offering no advantage in avoiding muggings in the future. The synaptic tagging-and-capture hypothesis alleges a weak stimulus can still create a long-term memory it it’s paired with a stronger stimulation entering the nerve through a different synapse. The changes in the nerve needed for it to store the memory are sparked by chemicals called plasticity-related proteins, which – according to the hypothesis – are ‘tagged’ in some way at each synapse. Previous research showed the chemical processes behind the two forms of memory formation have common properties, making it impossible to distinguish the two. But if those hypothetical tags happened to be different, that would provide a physical property that could be exploited. “One focus of our current research is to develop strategies to eliminate problematic non-associative memories that may become stamped on the brain during a traumatic experience without harming associative memories, which can help people make informed decisions in the future – like not taking shortcuts through dark alleys in high-crime areas,” says Schacher. 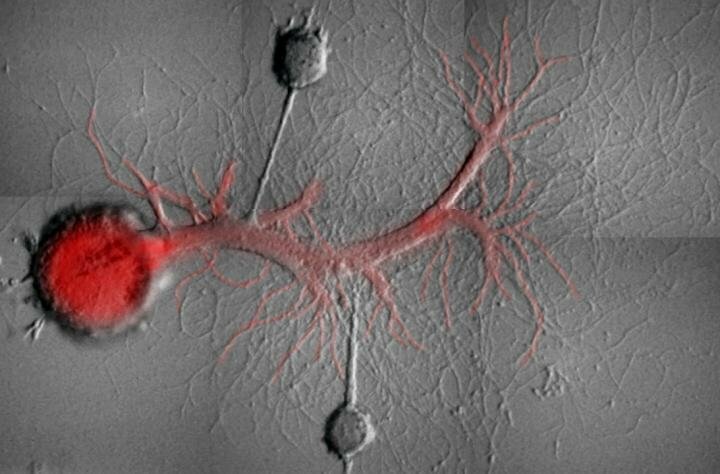 To keep things simple, the researchers took a pair of snail sensory neurons connected to a single motor neuron (dyed red in the image below). One sensory neuron was stimulated in a way that represented a strong associative memory; the other was stimulated to induce an incidental, non-associative memory. The researchers found that the strength of the connections at each synapse was the result of a two different types of protein called a kinase, types they called protein kinase M Apl I and protein kinase M Apl III. Selectively blocking just one of these kinases prevented that particular experience from etching itself onto the neuron, virtually erasing that specific memory from existence. That’s good news for Mr Aplysia, but what about humans? Fortunately, vertebrates also have similar versions for these kinases at work in memory formation, suggesting our brains work in rather similar ways. Far more research would be needed to come even close to developing a pharmaceutical capable of blocking traumatic memories, but the research opens a door that had been considered closed. “Memory erasure has the potential to alleviate PTSD and anxiety disorders by removing the non-associative memory that causes the maladaptive physiological response,” says Jiangyuan Hu from CUMC. It could one day be possible to take a pill after a mugging that would let your brain forget mailboxes and barking dogs while still recalling the colour of the assailant’s jacket. Recent research has also shown forgetting incidental information could have a big payoff in helping our brains retain other key information. Even without potential therapeutic applications, such a discovery still adds a significant piece to the puzzle on how our brains produce long term memories. Scientists Selectively Erased Memories In Snails — Are We Next?